While the plot of the hit Hollywood film "Gravity" is fictional, the United States must bolster efforts to address the alarming amount of space junk surrounding Earth, or risk potentially catastrophic collisions in orbit, lawmakers said today (May 9). Such real-life accidents could resemble the horrifying destruction depicted in the movie, they said. In a hearing before key members of the U.S. House of Representative's Committee on Science, Space and Technology, experts discussed the challenges of managing the growing threat of space junk. Participants included representatives from the U.S. Department of Defense, Federal Aviation Authority (FAA) and Federal Communications Commission (FCC), along with experts in space law and space situational awareness. Within the Department of Defense, the Joint Functional Component Command for Space (JFCC-Space) currently tracks 23,000 objects in low-Earth orbit. 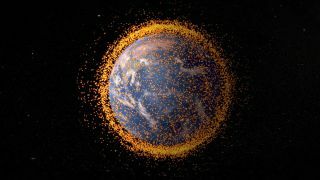 NASA officials have estimated that roughly 500,000 pieces of space junk larger than a marble circle the planet, and there could be more than 100 million tiny fragments, some as small as flecks of paint, that race around Earth at blistering speeds of 17,500 mph (28,000 km/h). George Zamka, a former NASA astronaut and the current deputy associate administrator in the Office of Commercial Space Transportation at the FAA recalled his own harrowing experiences with orbital debris during space shuttle missions. "During my two spaceflights, we flew upside down and backwards to prevent our space shuttle windows from being hit by debris strikes," Zamka said. Not only have NASA space shuttles and the International Space Station had to dodge space junk over time, but two major events have added considerably to the debris problem in orbit. In 2007, China intentionally destroyed a defunct satellite as part of an anti-satellite test that created a vast cloud of debris. The 2009 collision between two unmanned spacecraft, one a U.S. communications satellite and the other a dead Russian satellite, created even more debris. In their testimonies, the witnesses also suggested ways that Congress might approach policies related to space traffic management. Currently, the Department of Defense oversees surveillance of space as part of its national defense duties, yet with civil agencies, private companies and commercial space travelers all potentially sharing the space environment in the near future, it may be time to re-examine the policing of this increasingly congested orbital region, said Brian Weeden, a technical advisor with the Secure World Foundation, an organization dedicated to the peaceful and sustainable use of outer space. "While space surveillance began as a national security function, it has evolved into more than national security," Weeden said. The FAA is the sole federal agency with the authority to grant licenses to commercial space operators. Part of this regulatory process includes working with private companies to ensure their rocket launches will not generate even more debris in orbit, Zamka said. But, the FAA does not have the authority to regulate commercial activities in space. That job falls to the FCC for communications satellites, and to the National Oceanic and Atmospheric Administration (NOAA) for commercial Earth-watching spacecraft. As such, determining which agency should manage space traffic will likely pose a considerable challenge, Weeden said. In his testimony, he recommended the government assign the task to an agency that already has significant expertise with mitigating space debris, or create a new federal entity to oversee space surveillance. But to avoid any Hollywood-type disasters in space, the government must act soon, he said. "The continued expansion in the number of space actors [and the] the type of space activities has created a complex space environment," Weeden said. "It is vitally important for the U.S. government to design an approach to stay abreast of this ongoing change."